Anyhow all the animations are themed around Halloween and in particular Ghost stories. If you've already watched my animation you'll know it features GoAnimate's Full Energy Cast of characters as well as a couple of cameo appearances from characters in their Classics theme. Of particular note is the animated fire pit which I created myself using Pencil Animator, a program that I will be reviewing on this blog in the near future. Finally, I know the ending of my animation is pretty lame but, with a time limit of two minutes and the closing date looming, I just had to bite the bullet and end the story as best I could. Once the competition is over I may go back and do a better ending but for now, it is what it is. Hopefully the journey will make up for the ending. Oh, I'm sorry I didn't come through on this for you. I like the fire pit. I didn't realize it was you that made it. Great job. Looks good. You always make great stories. It did end quickly, but that couldn't be helped. That's okay Coady. Even with the views I can command it was always going to need some pretty hefty optimism to think this would make the final ten at such a late stage. The actual entry is not the story I wanted to tell. 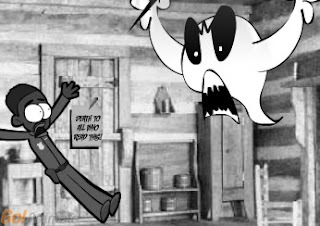 All that remains of the original idea is the cabin at Deer Hunter's creek with a Ghost in it (which originally was going to be an old man) and the fire pit (which ended up indoors because I couldn't find the right out door background for the original story idea). I wanted the fire pit to look more realistic than it does but again that was a victim of time.